One of the best things about working in a wine shop is bringing home a bottle of wine that you've had on the shelf for months that hasn't been selling, and going, "Holy Crap!! This rocks my socks!!!" Ever heard of a white Merlot? Me neither. 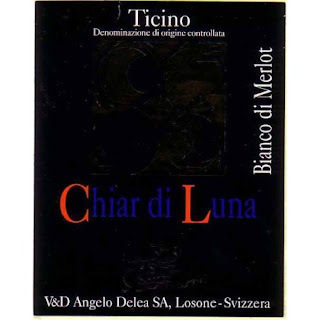 It's made from 100% Merlot grapes, from (wait for it) an Italian speaking part of Switzerland, called Ticino!! Like I said, it's so weird and dorky and just plain GOOD that all I can really say is, "Hello Addiction" ! !